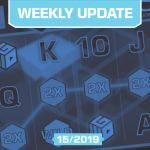 Another month has passed and we have another sack full of huge wins to empty for you featuring some of the community’s best known (and some of the less well known) streamers and players. In this video we have cherry picked the seven biggest wins from March for you to enjoy. Watch those magical reels spin in the wins and witness some awesome reactions from these serial grinders when they hit paydirt. Popular Finnish twitch streamer Teukka lands a huge win during a late night session of Merkur’s old school classic, Knight’s Life. This win was doubly lucky for Teukka as only seconds before he had told his viewers that he was only going to stream for a short session as he was so tired. He certainly woke up soon after when a free spin delivered a full payline of wild symbols with a 2x multiplier. Knight’s Tale only has 5 paylines with a line of top symbols paying a whopping 1000x the stake. With the 2x multiplier in play Teukka wins €10,000 from this €5 spin. Just for good measure the Finnish streamer lands a €500 win towards the end of his free spins round which nets him a total of €10,550 for a 2,110x score. March also saw our very own Slotspinner come up trumps during a session grinding NetEnt’s popular mid variance slot, Jungle Spirit: Call of the Wild. Having triggered free spins, Slotspinner choses the Elephant (the second highest paying symbol) as his dominant free spin animal. The popular CG streamer is rewarded for choosing a high variance symbol when he hits expanding Elephant symbols on the first 4 reels as well as 2 single Elephant symbols on reel 5. Paying out on 512 of the possible 1,024 ways to win Slotspinner bags a massive €12,800 win from his €5 stake for a 2572x win. 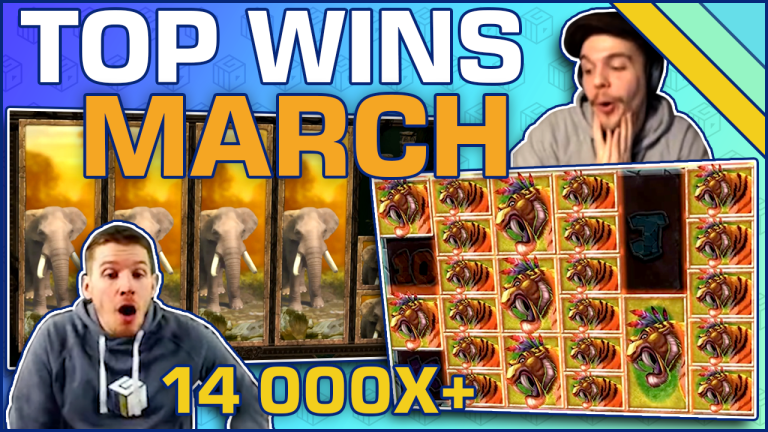 The 5th largest win of the month sees our favourite sardonic slotsmith Nickslots gets himself into a bit of lather after landing a colossal base game win playing Blueprint’s Primal Megaways. Playing £5 a spin Nick doesn’t look especially excited when a regular spin brings in several rows of mystery symbols. His countenance soon changes, however, when they all transform into the second highest value symbol (Tiger). With Tigers already on reel 1 and filling reel 2, the transformed symbols almost fill the board. The 4320 Megaways spin results in a £27,000 (5400x stake) win for the vocal Englishman. Nick’s reaction to this win is priceless, believe us! Ok, so a €583.70 win isn’t life changing money, but from a €0.10 spin it’s a mightily impressive haul. That’s exactly what player Justin managed last month playing Red Tiger’s high variance 2018 release, Dragon’s Fire. 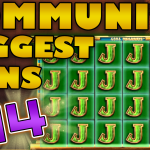 We join the action with Justin part way through a great free spins round with 90x stake in winnings already banked and 28 more free spins to go. Straight away we’re treated to Justin hitting full reel wilds on reels 1-4 with an 8x multiplier for a 1,119x stake win. Every win during the bonus round in Dragon’s Fire adds another multiplier up to a maximum of 50x. After landing another 50 free spins Justin easily makes it to the 50x multiplier and lands several more wins in excess of 1,000x the stake. In total his win of €583.70 represented a 5,837x win! Unfortunately we didn’t catch this mystery player’s name and it doesn’t look like he’s a streamer, although we’re fortunate that he managed to catch this epic win albeit with some rather shaky camera work, presumably recorded on his cell phone. 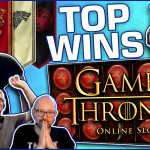 Big Time Gaming’s White Rabbit has given us some of the biggest recorded wins on multiple occasions, and once again it delivers here in spades. We join proceedings with the free spin round in full effect and already with a fully extended board offering 248,832 Megaways. This lucky punter enjoyed a total of 51 free spins and landed dozens of wins on his way to a €2,931.75 score. From just a €0.50 bet that makes a none-too-shabby 5,864x stake win. This huge win came courtesy of one of our favourite ever slots, NetEnt’s baddass cowboy gunslinger themed Dead or Alive. Unfortunately the twitch streamer responsible for the win, “Kriofferr”, would appear to be missing in action throughout this epic win. Although his head cam is in use, all we see is an empty chair. Clearly he had more important things to do while he won thousands of euros! Anyway, whatever he was up to his stream was certainly worth watching as he hits multiple wilds during the free spins round to rack up some serious cheddar. Having filled row 1 with wilds he is awarded an additional 5 spins to his initial 10. Furthermore, 3 wilds on the second row and another 2 on the third row combine to issue some spectacular wins. 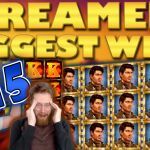 In total this absent streamer won himself €8,152.65 from a €1.35 bet, a 6039x stake haul. The biggest win (relative to bet size) we came across this month came from another amateur catching the action on a cell phone. This time at least we have a name for you, ‘Ligneto’. Playing CG’s 2018 slot of the year (as voted by you), Jammin’ Jars, this micro-stakes grinder earned a cool €2,736 from just a €0.19 bet. Unfortunately Ligneto didn’t start recording until he had already earned the bulk of his big win. However, this video is more than worth watching if only to hear the sheer joy and emotion in Ligneto’s reaction. He simply cannot believe his luck as he watches his balance rise to over 28,000 SEK from a 2 SEK bet. In total Ligneto’s epic win represented an almighty 14,421x his initial bet size. And we couldn’t be happier for him!